Since most of the time I work on a fairly encapuslated subsystem (Python support for KDevelop) and only a smaller part of my contributions goes towards the KDevelop / Kate core repositories, I don’t have any world-changing news to announce — unlike for kate and KDevelop, no Qt5 / KF5 porting is happening yet in Python support. It doesn’t make much sense to start porting until all the interfaces have stabilized. Some issues were fixed in the Execute Script plugin, which is — among other things — used to run and debug Python files. Especially, clicking items now works properly when the output filter is being used; for common mimetypes, a suitable intepreter and output filter is pre-selected; and you can now run scripts directly from the context menu. Python scripts and other common scripts can be run without going through the Launch Configuration dialog. The interpreter is derived automatically from the mime type. If this automatic detection doesn’t work you can edit the resulting configuration in the Run | Configure Launches. 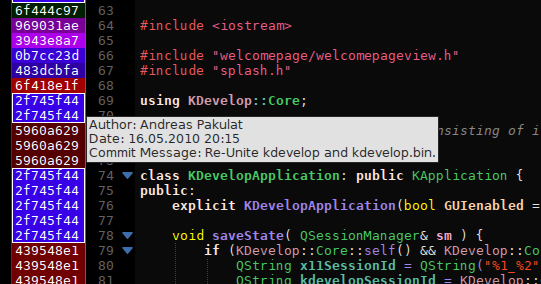 When you use KDevelop, you certainly noticed the small assistant at some point which pops up when there’s a problem in your code for which the language engine can propose corrections. This assistant was always very useful (not so much for Python yet, but I plan to implement some in near future) but had some problems in its current implementation. Especially, it looked really bad with the default colour schemes in some distributions; and its placement choice, which made it cover toolview controls quite frequently, was perceived as odd by many users I talked to. To make this assistant more flexible and more pretty, the widget was remade in QtQuick; it integrates with your editor colour scheme now and is placed inside the editor. There’s certainly room for improvement (comments welcome, just post them to the mailing list or the bugtracker), but the new implementation should make it easy to try different layouts and play with what works best. An underrated feature is the git annotations sidebar. It has been even more useful since you can bind a shortcut to it (I suggest Meta+A), which makes it very easy to look at who wrote some code, or why, and at which time it was last changed (using a shortcut was possible since the last sprint actually thanks to Aleix whom I annoyed until he implemented it because I couldn’t figure out a proper way to do it). In this sprint, I fixed a few small issues with it; especially, it now uses proper colours when you have a dark editor background colour. This feature has been there for a few weeks now but it turned out to be much more useful than I imagined (while other things I implemented turned out to be much less useful than I imagined — such is life). 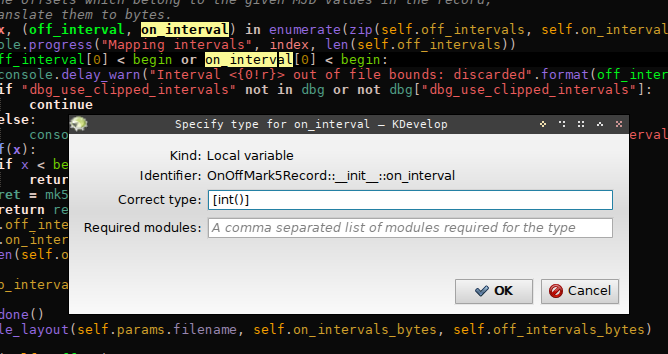 If you use KDevelop with git, you almost certainly were in the situation that you used e.g. git pull or git checkout while having affected files open in KDevelop, and then got lots of popup dialogs asking “The file was changed on disk, do you want to reload it?”. Those dialogs are by themselves a necessary and useful feature; they have protected me from data loss more than once, when I for example redirected the output of my program into its source file or fat-fingered some rm or git reset –hard command. For branch switches or similar operations, though, they are really annoying — and not only annoying, but dangerous too, since a warning with lots of false positives trains the user to click “ignore” as a reflex, and thus makes it possible that data loss occurs despite the warning. The aim of this feature is thus to attempt to reduce the dialogs to those situations where data loss could actually occur. The basic idea is, “when git has a version of a document in some tree, then the user can always go back there using git, so no data loss can occur”. So, when we know that a particular version of a document exists in some git commit, and that particular version of the document is currently open in the editor, and then the file gets changed on disk, it is safe to discard the open version and automatically load the new one. This is implemented with a combination of git-hash-object and git-cat-file. When an open document changes on disk, KDevelop will take the text which is currently visible in the editor and pass it to git-hash-object. That command simply computes a checksum of the contents, which identifies the data. Then it passes this checksum to git-cat-file, which will tell KDevelop whether a file with this checksum exists somewhere in git’s object datbase. If that is the case, the document is reloaded (or closed, if it was deleted on disk) automatically, without asking the user if he wants to keep the old buffer; otherwise, the old behaviour (popup dialog) is applied. The rationale is that the user cannot lose data if the check succeeds, since he can always retrieve the old version from git’s object database (for most operations, simply using git checkout on the most recent entry in git reflog is enough). It’s a minor improvement, sure, but it didn’t work before and caused quite some code to not produce the correct types. Another very minor feature, but neverthereless annoying that it wasn’t there so far. I don’t use the debugger much myself, so I didn’t notice it was quite broken since the 1.5 release (something about the output view changed in kdevplatform and I didn’t adjust the debugger code to work with it). Now it’s fixed, though, and I backported the fix to the 1.5 and 1.6 branches. Unfortunately, the debugger is still very hackish; as a user, you will most likely not notice that, but the code is a bit troubling 😉 It was originally only meant as a prototype, but worked so well that I didn’t yet implement it properly. If you have interest in improving the situation here — would be great! 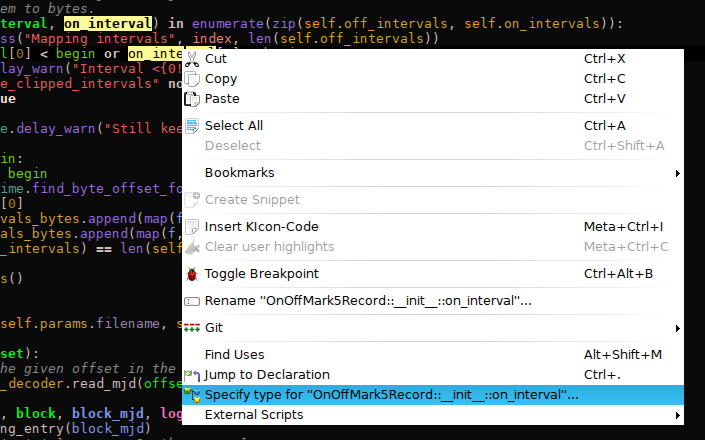 Click “Specify type” in the context menu. A magic dialog opens. 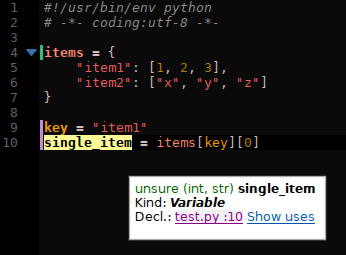 Enter a python expression which evaluates to the type you want the object to have; in this example, [int()] which evaluates to “list of int”. The information on what object has what type is bound to the names of the objects and stored in small, python-syntax files (similar to the existing documentation files). 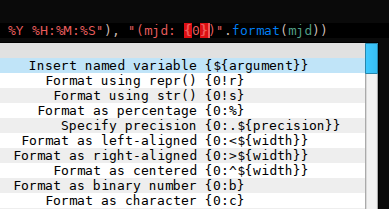 Thus, for libraries like matplotlib, we can ship with a very small (20 lines-ish) set of hints which already greatly improve the quality of code completion and highlighting for that library. And the best thing is, thanks to the above assistant, it is very easy for users to do it themselves (there’s certainly room for improvement in the UI, e.g. imports should really be added automatically since they are hard to get right). This is an experiment — we’ll see how well it works out in practice. A prototype for this feature was implemented in a branch a while ago, and as part of Google Code-In, Atanas Gospodinov implemented the actual generation of the hint files from the informaton entered in the UI dialog (which is the key part of making it actually useful for end-users). In the sprint last week, I did some final fixes on it and merged the branch, and now it seems to be working quite nicely. One thing I want to emphasize when talking about this feature is that it is not meant to specify hundreds of types in your source code. If you do that, you will run into problems (consider using things like “assert isinstance(…)” instead — it makes your code nicer, anyways). The new string formatting completion, implemented by GCI student Atanas Gospodinov, allows to easily craft advanced expressions in python’s string formatting mini-language by repeatedly invoking code completion while the cursor is in a string literal. Unfortunately, this feature is one of the things which turned out to be less useful than I expected. That is not Atanas’ fault — his implementation is fine (it even uses kate’s awesome template engine!). It’s an inherent problem of the feature; you just don’t do the task it supports terribly often. For this reason, I disabled its automatic invocation (i.e. automatic popup while typing) in the current master branch; it will only show up when you request it manually using Ctrl+Space. Before doing that, I personally found it getting in my way too much when typing e.g. 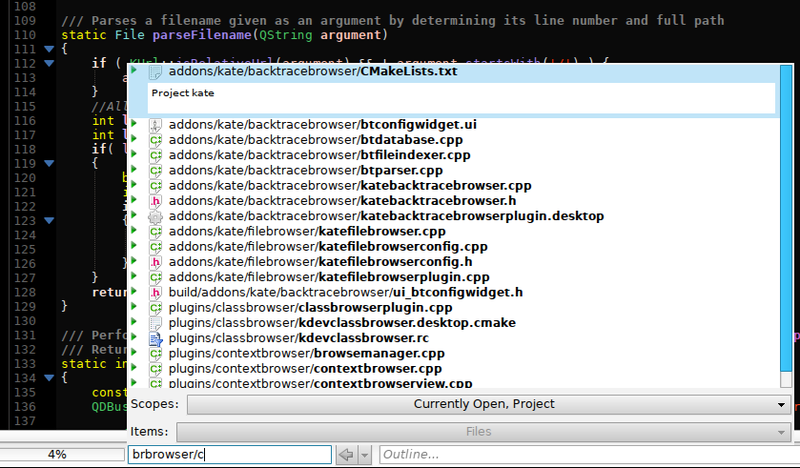 dict indexes which were strings. And not getting into your way is one of the key design principles of KDevelop. The Python 3 version is in the “python3-nofork” branch and can be compiled against Python 3.4 beta. It works quite nicely, and you could probably carefully start using it for actual work. It is even starting to gain some advantages over the Python 2 plugin, since I do no longer implement all new features in the Python 2 branch (in case ugly merge conflicts seem likely). 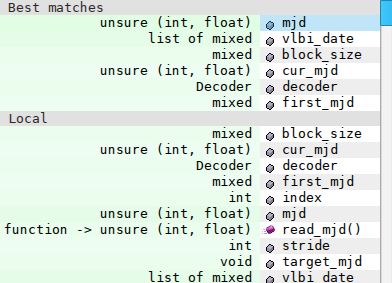 I have investigated making the Python 2 and Python 3 versions installable at the same time. Unfortunately, I currently don’t see a proper way to make this work. I’ll post an update in case I have an idea. Until that, the only way to get Python 2 and Python 3 support simultaneously (aka, in different KDevelop sessions which run at the same time — in the same session it’s not possible) is installing the two plugin versions into two different prefixes and creating helper scripts for launching KDevelop in those prefixes. I will publish a script which does this automatically in the future if I can’t find a better solution. As a final word, I’d like to mention that it makes quite a difference in performance whether you compile kdev-python and kdevplatform in debug or release mode. For daily use of the program, I would really recommend building in release mode; everything is much smoother. If you encounter a crash, it has to be reproducable to be a useful bug report anyways, so you can just recompile in debug mode and trigger it again to get a proper backtrace.